The last few days of the voyage, and some final questions answered! Firstly, from Greytown School years 4 and 5. What clothing and special gear do you need to wear when you are on deck on the ship in the icy wind? We talked about this back in blog post 12: Cold weather protection. 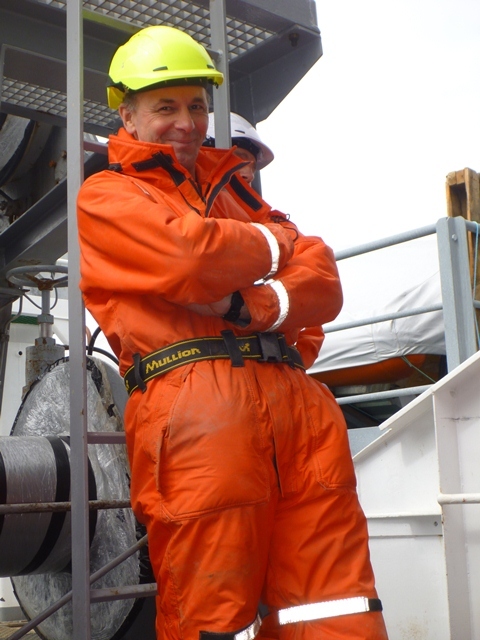 And here is a photo of Mark Fenwick (the father of Ella, from Nelson College for Girls) dressed up in his cold weather gear. How far in km is Antarctica from Wellington and how long does it take you to travel to Antarctica by boat in good weather conditions and in bad weather conditions? Wellington is 2500 nautical miles – about 4630 km – from the Mertz Glacier Tongue. What is it like to see a polynya? I am not sure as we didn’t really get to one on this trip because of the large amount of sea ice. It is just an open expanse of water that is surrounded on all sides by sea ice or glaciers, so I imagine that depending on how big it is, you would just see the sea with ice in the distance. How close to home are you now? We are just approaching Auckland Island, 700 nautical miles (about 1300km) south of Wellington, so just a couple of days to go. Have you tested any new equipment while being there, and if so what was it and how did it perform? We had a new underwater camera setup which can be attached to the CTD frame. We have had a few minor problems with learning how to use it, for example, we were not charging the batteries enough. But in general we think it worked pretty well and we got some good images from it (see blog post 28: It is all about the critters! for a little movie from the camera). From Dasha: How do animals react or adapt to the seasonal change in daylight hours – 24 hours light vs 24 hours night? Large animals either hibernate or migrate to more tropical climates during the winter, so whales go up to places like Tonga. Small phytoplankton can’t photosynthesise if it is dark, so they go into a resting state and wait out the winter until there is enough light in summer. Ella: Are the events which occurred on the tongue of the Erebus glacier of the same interest to the scientific community as the breaking off of the Mertz Glacier tongue? Glaciers are not created equally. The Mertz Glacier Tongue had a big impact, because of its location and its size. The Erebus Glacier Tongue is quite small, and although it will have some local effects it won’t really change how the ocean flows through McMurdo Sound. Fliss and Tiana: Throughout the voyage, has there been an area where the temperature has risen a significant amount in the sea? We see significant changes in sea surface temperatures when we cross ocean fronts. There are several major fronts between New Zealand and Antarctica – the subtropical front, subantarctic front and the polar front. Between our northern-most station, near New Zealand, and Antarctica the temperature change was about 13°C at the surface, from 11°C near the Auckland Islands to about -2°C near Antarctica. This is not as large as the temperature change in the atmosphere, though – it was about 23°C when we left Wellington, and as cold as -10°C near Antarctica. Many of the CTD stations are repeats of previous stations that have been measured over the last couple of decades (see blog post 32: Sections through the ocean), so when we get back we will compare the data over time. There is a lot of variability in the ocean from one year to the next, so only by comparing many years of data will we know if the oceans are really warming up over time. Katelyn: How deep are you sending your GoPro cameras to get footage? What cameras do you use to get a view of the ocean floor? The GoPro camera can go to 2000m water depth, and it is not the only camera that we use to get footage of the sea floor. In the past we have used another camera system called the DTIS (Deep Towed Imaging System). The GoPro system we have been trialling is more of an opportunistic camera that can be attached to other gear and therefore it doesn’t give images which are quite as good as we would expect from the DTIS. Anne: Would you put a trip like this on your CV? For many of us we will add it to our list of voyages already on our CV. But for most of the students it is their first voyage, and I am sure they will include it on their CVs when they are looking for a job after they have finished their studies. And – what part of the voyage was the most enjoyable? How much of the data you collect on this voyage will be analysed immediately, and how much can’t be analysed until much later? We are constantly monitoring the data to check that the quality is good and that there are no blockages or breakages in the equipment. We will have a look at all of the data before we get off the ship, so that we can write some preliminary results for our voyage report. However, most of the detailed analyses of the data won’t be done until we are back in the laboratory or office and it can take many years. This is especially true for the sedimentary cores as there is a lot of processing and laboratory analyses to be done. I probably won’t need to go to sea to collect more cores for quite a few years after this. Most of your equipment must be very expensive and the conditions harsh. Is there a trade-off between how much data you can collect and the ideal amount of data? Most of the equipment is expensive, but it is built for harsh conditions. One of the main issues we have experienced has been the freezing up of the water in the CTD sensors when it comes back on deck as the air temperature is much colder than the water temperature. We have to make sure the sensors are all dried out and we have little heaters ready to stop them freezing in between the stations. Time is the biggest factor affecting how much data you can collect. While we do work 24 hours a day, 7 days a week while we are on the voyage, there is a lot of time in transit between stations, and also time lost due to bad weather (although we have been pretty lucky with that so far this trip). Our biggest challenge has been the sea ice as this restricts where we can go, and has caused several changes of plan on this voyage. Ideally for our science we would like to collect a lot more data, but practically this would also mean a lot more processing and analysis back in the laboratory, too…and that would probably require several lifetimes, or a lot of students to help. Do you often have to have several trips to gain enough data to put into climate models etc.? Yes. It requires many voyages, over many years, to start to understand the oceanography of a region, especially changes that happen over timescales longer than a year, e.g., natural oscillations like El Niño or the Southern Annular Mode. Climate change is also causing the ocean to change, so we need to keep monitoring it to understand how it is changing, and how rapidly these changes are occurring. There are many different types of models and they all have subtle differences in their physics (and in biogeochemical models – also the biology and chemistry). Usually, several different models are run for the same scenario and then the model outputs are compared. Ideally the models will provide similar outputs which match the current datasets. These models can then be used to predict future changes given certain scenarios and similar starting conditions. There are always approximations that need to be made in models, as computers just aren’t powerful enough to include every little thing. But models can be useful to understand the interactions and feedbacks in the system. They are also the only way we can forecast and plan for potential future changes. The scientists on this voyage are from several different countries. How do they work together on the same project when they are living in different countries? Scientists rarely work on their own. Most projects involve a team of several researchers, technicians and students, each doing a small part of the bigger project. This is especially the case for multidisciplinary projects, which require the expertise of several areas of science. This means that scientists have to be good at working in a team and communicating with other researchers from different backgrounds. For some of these projects there may not be anyone suitable at your own institution, and so you need to find collaborators from different universities or research laboratories. In small countries like New Zealand you may have to link up with overseas researchers that have the skills and the equipment (and funding) that you need to work on a particular problem. With modern communication via e-mail, skype and video conferencing, it has become much easier to collaborate with colleagues that aren’t in an office down the corridor. Most good collaborations come down to trust. A lot of new friendships and possible future collaborations have developed on the voyage as the researchers have got to know each other and have been discussing their shared scientific interests. Sometimes being on the ship in the rocky ocean swells reminds me of the poem by AA Milne –“when she was good, she was very very good, but when she was bad she was horrid”. 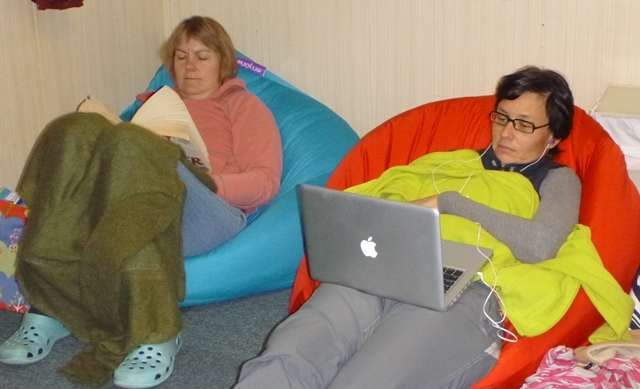 One thing that improves the life for us when the seas are being “horrid” is the humble beanbag. It allows you to continue to work rather than have to retreat to your bunk when your sealegs have abandoned you. Two days into the voyage, it suddenly turned rough around dinner time. Out came my beanbag and quickly became the popular sitting spot while I was looking after the multibeam. It wasn’t unknown to sit in the multibeam lab in greater than 30 knot winds watching 6 screens from the comfort of a bright red beanbag on the floor. The beanbag somehow cushions you from the movement of the ship and when it gets really bad, you can just snuggle down and close your eyes for a few minutes’ nap. 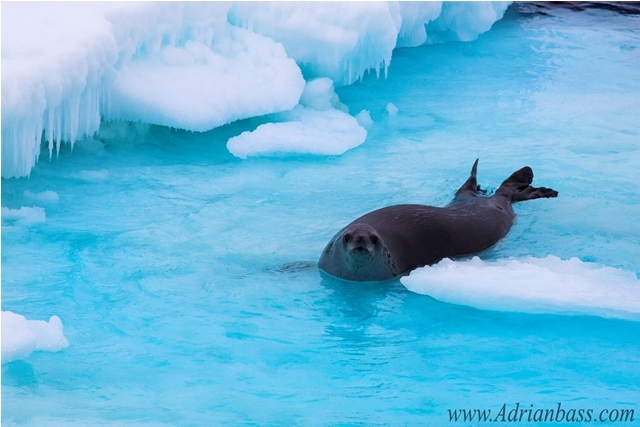 While we were in the sea ice, when the large ocean swells are absorbed by the sea ice, the beanbags were abandoned. But on our voyage home, the rocking and rolling seas have tested our sea legs again, leading to several of us retreating back to the beanbags. In fact, a couple of nights were tough with the ship continuously rolling from side to side. It is hard to sleep when you are trying to wedge yourself in to your bunk and much easier to sleep in the beanbag. And when we get home, my beanbag is coming home with me as a spare seat in the lounge. After this voyage I have a new appreciation for it – although it might put me to sleep while I am watching my favourite TV shows!